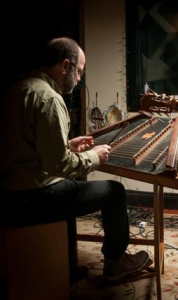 Cliff Cole fell in love with the hammered dulcimer at the Philadelphia Folk Festival three decades ago, and he’s been hammering on ever since. He started off as a drummer playing rock, jazz, and blues, and then carried that musical experience and sense of rhythm over to the hammered dulcimer and folk music. Rounding out his musical expression, Cliff studies acoustic guitar, plays the blues harp, and enjoys singing. For many years, Cliff has presented workshops at dulcimer and folk music festivals, including The Cranberry Dulcimer Gathering, Nutmeg Dulcimer Festival, The Pocono Winter Fest and the French Creek Retreat. Cliff’s first regular dulcimer gig was playing Bluegrass with Steel City Strings in the late ’80s. He then founded the folk ensemble DayBreak in 1989, and they are still performing together today. The group has delved into many musical styles including Celtic, Old Time, Bluegrass, American folk, early music and their own original tunes, many of which Cliff created and arranged. Over the years, Cliff produced six recordings with DayBreak, including Lost Cave, which was recorded live inside Lost River Caverns in Hellertown, PA., and two recordings with his daughter, accomplished vocalist and poet, Emily Rose Cole. Cliff can often be found in the recording studio working on some new, secret project.